Our hotel for dogs on Long Island was created to provide your pets with a cozy and ultra clean environment to rest and relax while you are away. Our deluxe sleep suites offer 24 sq ft of pure luxury and are outfitted with cozy, snuggle worthy raised beds. Our dog hotel guests will begin the day with breakfast and fresh water, followed by a walk in our indoor park to stretch and complete their business. Their suite will be cleaned and refreshed. Discounted rate applies for additional dogs, sharing same suite from same household. We offer a social boarding experience. 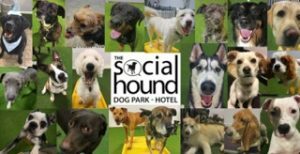 All our dogs play and socialize during the day, interacting with our loving staff as well as other dogs staying at The Social Hound. This helps your dog gain confidence and feel relaxed during their stay. In the evening guests will be fed dinner and take a return trip to the dog park to stretch/complete their business and then be tucked in to their cozy beds for the night. Although we cannot replace the love you give your dog, rest assured we give them all the attention they can handle. Bringing your dog to The Social Hound allows them to have a great time exercising their body and soul while you are away from them.